Comments on the Downtown Hospital Draft Environmental Impact Statement (Draft EIS). The Applicant is Mohawk Valley Health System. The Project is the proposed Hospital. SEQRA is the State Environmental Quality Review Act. The availability of State funds for the Project was announced in early 2015, the site for the Project was announced in September, 2015, and we just got around to SEQR in 2018 when the Oneida County Industrial Development Agency made a Positive Declaration. Does that sound like “incorporating environmental review early in the planning stages” so that “projects can be modified as needed to avoid adverse impacts on the environment?” Why was SEQR not part of the planning of the Project from the very beginning, including the choice of the site? As noted under Part I Section I, the site of a project is an appropriate consideration under SEQR, and the State promulgated a non-exhaustive list of those actions considered to have significant adverse impacts (6 NYCRR 617.7(c)(1)). This could have been used to help screen or rank the sites – but it was not. People may disagree with how the regulations were applied or sites ranked in Part III above, however, the process only took a few hours. This Project deserved at least that level of attention being paid to the environmental consequences of site selection. Most people would probably intuitively conclude that trying to shoehorn a hospital with acres of parking into the middle of a Central Business District that was built for another era, another style of development, and a different purpose would be more disruptive to the environment than locating the hospital on a site that had enough room and had been specifically designed for that use. It is no surprise that the choice of site is still a controversial topic after three years. For a major project such as this, ENV 8-0109 requires preparation of an EIS. The regulations make clear that a government agency cannot undertake, fund or approve of an action until it has complied with the provisions of SEQR (see 6 NYCRR 617.3 (a)). But that is, in deed, what happened at least as far back as Summer 2016 when Oneida County put county employees, and Utica put city employees (the Planning Board’s Staff), to the task of engaging in regular meetings with MVHS to help plan for the Project at the Downtown Site, because government employee time is money. If the applicability of SEQR and need for an EIS was not apparent to the local authorities at that point in time, then it should have been apparent when the County approved funding for MVEDGE to provide property appraisal services for MVHS aiding the pursuit of the Downtown Site. The County should have stopped further action and opened the SEQR process then, but it did not. 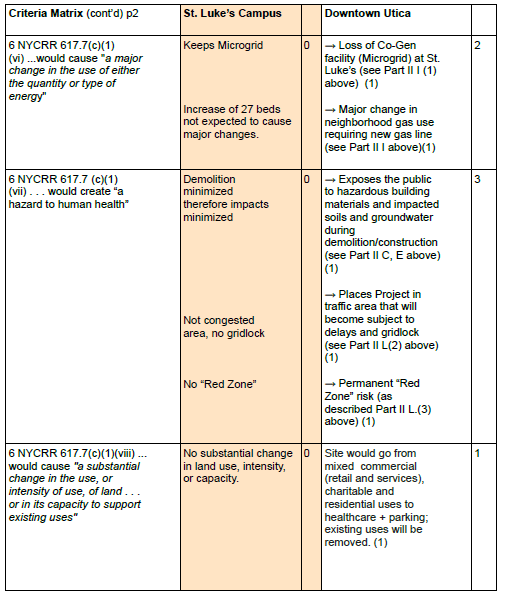 Nothing was done about SEQR until there was an “application” that triggered a review – but, as noted above, the law wants the environment taken into consideration “early in the planning stages” so that “projects can be modified as needed to avoid adverse impacts on the environment.” Here, the County and City had employees planning this project without the environmental information required by law. It is a shame that so much time and money was spent on a flawed process. Like the Site Selection Process appears to have been tainted by undue influence, the entire EIS appears tainted as well. People who have personally invested their time toward securing the Project for Downtown will have difficulty focusing on another site – an impossibility for those where the alternate site is in another jurisdiction. At this point in time the Planning Board is faced with (1) an EIS that cannot support a SEQR finding because St. Luke’s appears to be the environmentally superior site and (2) having to give up jurisdiction because it has no legal authority in New Hartford. The EIS must be rejected as inadequate, and the process reopened for a new Lead Agency to produce a revised Draft EIS that addresses all the open issues identified herein. Comments on the Downtown Hospital Draft Environmental Impact Statement (Draft EIS). The Applicant is Mohawk Valley Health System. The Project is the proposed Hospital. Numerous adverse environmental impacts as identified by State regulation or law will be avoided or minimized by simply relocating the Project to the St. Luke’s Campus. A. Impact on Land: This topic is addressed in Draft EIS Section 3.1. Exposure to impacted soils due to past urban use is recognized to be a concern. The EIS needs to acknowledge that this concern could be mitigated by Relocation of the Project to the St. Luke’s Campus due to the relative lack of prior development there. 1.) Section 3.9 states that the new facility is expected to generate 187,000 gallons per day (gpd) of waste water; however, it also states that facility average water demand will be 500 gallons per minute (gpm), which equals 720,000 gpd. The 533,000 gpd difference between what is going into and what is coming out of the facility is unaccounted for, suggesting that the facility could potentially generate as much as 720,000 gpd (500 gpm) of waste water. Since that amount would be greater than the 360 gpm design flow that the local Publicly Owned Treatment Works (POTW) indicated it could accept (Draft EIS p3525/3527), there is a potential violation of the Clean Water Act that needs to be resolved. 2.) Assuming that the POTW has sufficient capacity to handle the wastewater from the facility, it is not clear from the Draft EIS that all the wastewater will reach the POTW due to the combined sewers and Combined Sewer Overflows (CSOs) that exist in the City of Utica. As noted above, the facility will be a significant new source of waste water in Utica. The route that the waste water will take from the facility to its ultimate disposition in the environment needs to be identified and traced. The illustration of the sanitary sewers proposed to serve the facility (Draft EIS p98/3527) does not show the ultimate disposition point. If the facility’s wastewater at any point flows past a CSO, some of it could end up in the River or Canal untreated, further impairing water quality, possibly causing a violation of the Clean Water Act, and/or leading to a reclassification of the CSO as an illegal Sanitary Sewer Overflow (SSO), which would lead to an environmental enforcement action against the City of Utica. The EIS needs to clairify where the wastewater will wind up and whether it would exacerbate water quality impairment. 3.) Given the recent demolition of the Tartan Textile Building to make way for the Nexus Sports Center, the sports-and-entertainment “U District” envisioned for the area next to the Auditorium and across Oriskany Boulevard from the Project site is no longer speculation. The potential generation of waste water and runoff from the U District needs to be examined with all the above as a Cumulative Impact. 4.) The Draft EIS fails to consider relocation of the Project to the St. Luke’s Campus as mitigation. (a) The number of patient beds will be close to those currently/historically on site, suggesting that the Project environmentally would be the replacement of an existing facility on site with no new impacts other than construction/demolition. (b) The federal wetland on-site naturally buffers surface water impacts. (c) Redirection of all sanitary waste flows through the Sauquoit Creek Pump Station will mean that no untreated waste will reach the River/Canal once current Consent Order work is completed. (d) There are no pending large projects near by that would cause cumulative impacts. C. Impact on Groundwater: This topic is addressed in Draft EIS Section 3.3. The presence of impacted groundwater from prior industrial uses is mentioned as a concern. The EIS needs to acknowledge that this concern could be mitigated by Relocation of the Project to the St. Luke’s Campus, due to the lack of prior industrial uses there. D. Impact on Flooding: This topic is inadequately addressed in Draft EIS Section 3.2. 1.) On July 1, 2017, significant flooding (causing abandonment of cars, risk to human life, and property damage) occurred on a newly reconstructed and re-opened section of the North-South Arterial and adjacent Lincoln Avenue in an area labeled “area of minimal flood hazard” on the federal map. Per media reports State DOT officials claimed that their drains worked properly but indicated there was insufficient capacity in the storm sewers or receiving stream to prevent the flooding from occurring. This flooding occurred approximately one half-mile from and at a higher elevation than the Project site. The Draft EIS mentions this event (p 57/3527) but fails to elaborate on it in spite of the concern being identified during Scoping. The Project description indicates that some existing storm sewers will be removed, some will be used, and others will be constructed. However, the Draft EIS fails to reveal whether the Project will depend upon any of the systems that were overwhelmed by the 7/1/17 storm. That information should be put in the final EIS. 2.) The Draft EIS acknowledges that full build out of the Project has the potential to increase stormwater runoff and exacerbate downgradient flooding during storms (p. 60/3527) but dismisses the issue with a statement that the Project will result in more pervious surfaces than now (implying less runoff). The Project’s acres of new, unbroken pavement are expected to have a different water retention characteristic and likely will be less able to retain/slow/infiltrate runoff than the existing patchwork of old/broken pavement, sidewalks, roofs, yards, etc. Whether or not flooding will actually occur cannot be known without calculations using surface characteristics, areas, and design storms. The EIS should use the rainfall pattern of the 7/1/17 storm to produce a hydrograph of the runoff, and use same to determine if the storm sewers and streams serving the Project site have the capacity to carry away the storm water to the Mohawk River/Canal without creating urban flooding. 3.) Runoff from the proposed “U-District” adjacent to the Downtown site must be addressed as a cumulative impact. 4.) The Draft EIS fails to consider relocation of the Project to the St. Luke’s Campus as mitigation. (a) The number of patient beds will be close to if not within those currently/historically on site, suggesting that the Project environmentally would be the replacement of an existing facility on site with no new impacts other than construction/demolition. (b) The wetland on-site is a natural flooding buffer. (c) The 7/1/17 storm caused no flooding at or near the St. Luke’s Campus. (d) There are no pending large projects near by that would cause cumulative impacts. E. Impact on Air: This topic is addressed by the Draft EIS in Section 3.4. 1.) Fugitive emissions from regulated materials and impacted soils is acknowledged as a potential concern during construction (Draft EIS p. 67/3527). Relocation of the Project to the St. Luke’s Campus should be considered to mitigate this concern due to the lack of prior industrial uses at that location. 2.) The Draft EIS acknowledges that the Project’s road closures could increase emissions from mobile sources (p. 64/3527). Relocation of the Project to the St. Luke’s Campus should be considered to mitigate this concern because road closures would be unnecessary at the St. Luke’s Site. 2.) Relocating the Project to the St. Luke’s Campus where the standards do not apply and the building form is consistent with what is already on-site. Another short-coming of the Draft EIS is the failure of its artist renderings to show the Project in context with surrounding buildings from important vantage points. Utica has a distinctive and unique skyline perhaps best appreciated driving south on Route 12 Arterial or east on Oriskany Boulevard. The Arterial/Oriskany Boulevard interchange is an important Gateway to Downtown. Travelling east on Oriskany Blvd. as one emerges from under the interchange, the skyline of Utica is revealed, ‘up close and personal’ on the right with prominent architectural examples such as the Adirondack Bank Building, Grace Church, State Office Building, new Bank of Utica clocktower, City Hall’s ‘Tower of Hope,’ and M&T Bank’s “Gold Dome” alternately coming into view. These buildings are also viewable as one travels south on Rt. 12 over the interchange. From either vantage point, the Project’s massive, lengthy, 9-story “slab,” out-of-scale with the neighborhood and street-grid, and placed across Cornelia St.,will block these views. (From Google Maps. Eastbound Oriskany Blvd emerging from interchange. This viewshed is better appreciated in-person from different points while driving, without Google Map’s distorted perspective). and proposes forms of mitigation. unavoidable adverse impact to traffic. expended, and more pollution is created. St., the redundancy will be lost. St. to Baggs Sq. W. to only via Broadway. unmitigatable adverse impact to transportation. NYSDOT’s Route 5S work. After the State closes the Washington and Seneca Sts. Baggs Sq. W from Court St. if Broadway were to become temporarily blocked? conservative given scale-back in Applicant’s operations)? suggest a Cumulative Impact to traffic. accordance with applicable codes to minimize impacts. to disclose and needs to acknowledge the impact of the Project on the Co-Generation Facility recently constructed on the St. Luke’s Campus that is shared between St.
energy system, would have to close if the hospital were to be moved to the Downtown site. Gen facility and undercuts Applicant’s sustainability. whether such impacts could be avoided or lessened by relocating the Project to the St.
Luke’s Campus given the Co-Gen facility being on said campus and no “U-District” nearby. be in public rights of way just off-site. 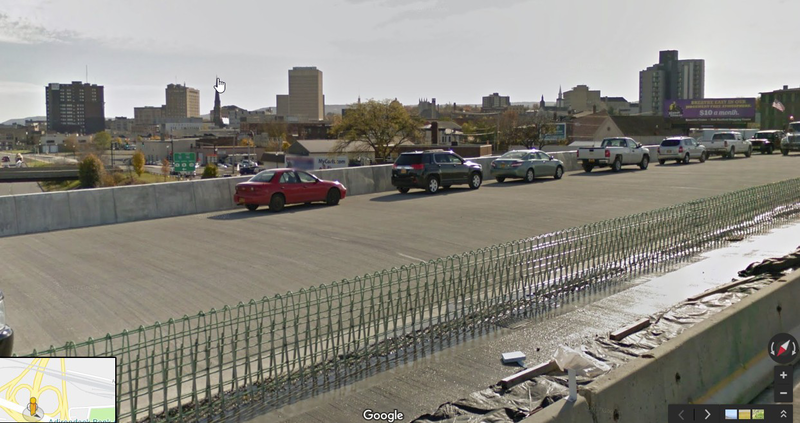 demand for this type of environment for redevelopment in Utica (e.g. recent Baggs. Sq. grid would be the waste of a community resource needed to foster redevelopment. 2.) The Draft EIS fails to address Cumulative Impacts from the “U-District” on utilities. be better monitored by an on-site Applicant. reference to site, and attempts to address the “red zone” railroad problem. the system of care by placing 2 miles between the new hospital beds and the rehab/nursing facility, (b) removes the anchor institution from the existent defacto medical district near the Utica/New Hartford line, (c) gives the Applicant an additional medical campus to manage; and, apparently, per the Applicant’s own numbers, (d) undermines Applicant’s financial stability by increasing the number of staff per hospital bed. (See Part I above). area where delays will be exacerbated by the Project’s own traffic and street closures. difficult and life threatening. (See Section H above). flaw” of the Downtown Site. gridlock and the red zone because the St. Luke’s Campus does not carry such risks. comments on this topic (Draft EIS p. 1036-7/3537) since they were disregarded. (an area bounded by Genesee, State and Columbia Streets and the CSX Tracks). incrementally over Utica’s history by City ordinances. N. Impacts on Solid Waste Management: The Draft EIS addresses this topic in Section 3.13.
mitigation of this environmental impact. the neighborhood, if not destroy, about 40 business and other entities where people are working. and Compassion Coalition. Jobs and services clearly are going to be lost to the neighborhood. each relevant area of environmental concern. SEMC,” and is otherwise ignored. create a need to build a new Police Campus (Garage, Station and City Court) elsewhere. services, making the public more dependent on the automobile, and wasting energy. the Medical Office Building and the Co-Gen Facility). checked – without any apparent understanding that the purpose of the law is to minimize sprawl. Policy on its head. The EIS needs to acknowledge that relocating the Project to the St.
the three negatives listed above. relocating the Project to the St. Luke’s Campus. topic in Section 7. The wording used attempts to minimize the significance of what will be lost. and the wasting of community resources). taxes for everyone else and making Utica less attractive for investment. also acknowledge that they could be minimized by placing the new facility on the St. This issue is addressed in the Draft EIS in Section 2 and Appendix D.
The Applicant was requested numerous times to disclose the Site Selection Study it relied upon in choosing the Downtown site. 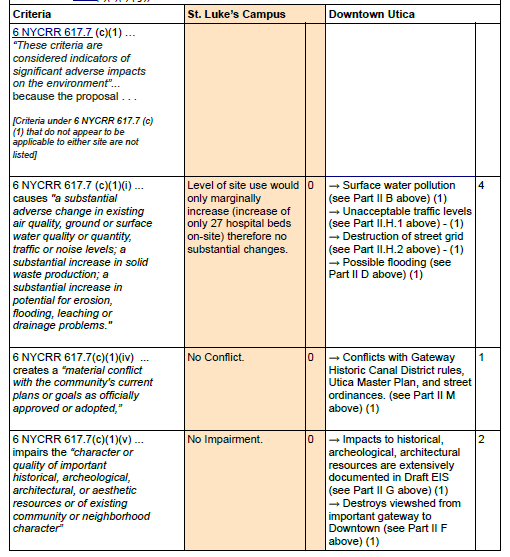 Instead, the Draft EIS supplies only a “Summary Memorandum” of the site selection process (and only in draft form). This appears at Appendix D to the Draft EIS. The Applicant needs to submit the actual study its Board relied upon rather than a summary, so the Public and relevant authorities do not have to speculate on what was left out. When Applicant announced in September, 2015, that it had chosen to build the Project at the Downtown site, it also stated that “In the event the downtown site proves not to be financially viable, we will move on to our second site option at the St. Luke’s Campus, which the board feels will also serve the community well.” This is an admission that the Project is feasible at the St. Luke’s Campus in New Hartford. Since an applicant under SEQRA cannot be made to consider sites it does not own (see 6 NYCRR 617.9(b)(5)(v) ('g')), the Draft EIS needs to explain why the Applicant felt compelled to do so. Applicant’s Project depends upon a grant provided under Public Health Law (PBH) Section 2825-b. The grant application will be judged on “the extent to which the applicant has engaged the community affected by the proposed capital project and the manner in which community engagement has shaped such capital project.” (PBH 2825-b (4)(f)). The Applicant never at any time engaged the Public on the proposed location of the Project. In fact, there is evidence that local officials deliberately kept the discussion of facility location away from the Public (See word-searchable e-mail ‘dump' or images, 9/1/15 e-mail, Anthony Brindisi to Steven DiMeo and Anthony Picente: “I don't want public opinion derailing this.”) Had the Applicant engaged the Public at the site selection stage, Applicant would have been able to develop appropriate siting criteria to address the Public Interest (e.g., convenience of the Public to access current medical providers and the new facility, loss of businesses and taxable properties, disruption to traffic patterns, need to construct new municipal facilities and public infrastructure, changes to community character, facility location relative to transportation of hazardous substances, etc.). Given PBH 2825-b(4)(f), if the Applicant continues to pursue a site other than St. Luke’s Campus, it needs to reopen the site selection process for Public Input and to develop appropriate criteria for choosing a site that protects the Public Interest. The Summary Memorandum states that a Geographic Information System analysis was initially used to “identify parcels 50 acres and larger that could potentially host a new combined facility”. Of the 12 sites subsequently considered for “fatal flaws,” an exception to the above rule appears to have been made for the Downtown Site because it is neither a “parcel” (actually being about 90 parcels as shown on County ownership maps) nor is it 50 acres (actually being from 17 to 34 acres depending upon how the site is defined). Since the other 11 sites (e.g., 5 of them are golf courses) more closely match the 50-acre-parcel rule, the Downtown site is dissimilar to the others. The Applicant needs to explain why an exception was made to its 50-acre-parcel site-screening rule to put the Downtown Site on the list of sites to be considered, otherwise its placement on the list appears arbitrary. According to the Summary Memorandum, the 12 sites were screened for “fatal flaws” – “factors that could impact the development potential of the site.” The Downtown Site is currently occupied by some 40 entities including Private Businesses, Not-For-Profits, and a Municipal Police Garage. It is also occupied by streets that would have to close to accommodate the Project. The Site has been in use for nearly 200 years. The length and level of use of the Downtown Site (detailed in Appendix E of the Draft EIS), which could be expected to complicate any redevelopment, make it markedly dissimilar to the other sites which are mostly outside the urban core. The Applicant needs to explain why the current and past history of uses were not considered a “fatal flaw” that would warrant rejection of the Downtown Site, otherwise its “fatal flaw” analysis appears arbitrary. The current occupants and uses of the Downtown Site reflect almost 200 years of official City of Utica decision-making (ranging from zoning and street layout to lot sizes). Applicant’s proposal to replace the Columbia-Lafayette neighborhood with a campus of medical buildings, parking facilities, and discontinued streets is inconsistent with these prior decisions. The Gateway Historic Canal District (which covers the Downtown Site) has a plan and design requirements that were adopted in 2005. The Utica Master Plan of 2011 and its 2016 Update, were officially adopted to guide future development within the City. None of these call for a transformative change to the Columbia-Lafayette Neighborhood. Neither the Applicant, nor its consultants, nor the elected/non-elected persons/officials who want the hospital Downtown (see K., infra) have the legal authority on their own to change Utica’s official plans, ordinances, etc. The Applicant needs to explain why the existing laws and plans etc. were not seen as a “fatal flaw” that would require rejection of the Downtown Site, otherwise its “fatal flaw” analysis appears arbitrary. The Applicant currently operates two hospitals (St. Elizabeth’s and St. Luke’s) and a number of other facilities in the Utica area. The largest facility is St. Luke’s Hospital in New Hartford with 370 inpatient beds (inclusive of 24 physical medicine and rehabilitation beds co-located in a separate building on the St. Luke’s Campus with a 202 bed nursing home). Applicant proposes to use the grant provided under PBH 2825-b to consolidate and reduce beds from its 201-bed St. Elizabeth’s Campus (SEMC) with those from St. Luke’s into a new facility that would have 373 beds (excluding the 24 physical medicine and rehabilitation beds, which would remain in their current location at St. Luke’s) (see Draft EIS p173/3527). In spite of the consolidation of hospital beds from two facilities, the Applicant proposes to maintain some functions at both the St. Elizabeth’s and St. Luke’s Campuses. The St. Luke’s Campus qualifies for funding under PBH 2825-b because, being on Utica’s western boundary, it is located in Oneida County’s “largest population center,” the wording of the law deliberately not restricting funds to the City of Utica. As noted under B., above, Applicant acknowledged that the Project is feasible and would be built on the St. Luke’s Campus if it could not be done Downtown. If the new facility were to be constructed at the St. Luke’s Campus instead of Downtown, it would represent an increase of only 27 hospital beds (about 7%) on that site. In this regard it is also noted that the St. Luke’s Home on-site has already reduced its long term care beds by 40 (Draft EIS p653/3527). While long term care beds may not be the same as hospital beds, it suggests that even with the addition of beds transferred from SEMC, the overall use of the St. Luke’s Campus with a combined hospital facility would be less intense than it had been in the past. The Project is supposed to be judged upon the extent to which it “will contribute to the integration of health care services and long term sustainability of the applicant...” (PBH 2825-b (4)(a)). Focusing on (4)(a)’s “sustainability” clause, creating an additional campus Downtown for the Applicant to build and maintain intuitively seems to contradict this goal. Intuition, however, appears substantiated by Applicant’s own numbers which reveal that, in spite of a projected reduction of 184 employees, there will be an almost 33% INCREASE in the number of employees PER BED from about 4.75 before consolidation to at least 6.3 after consolidation. (See the number of beds cited above and Applicant’s pre and post consolidation employee estimates at Draft EIS pp589-90/3527). development of primary care and other outpatient services...” PBH 2825-b (4)(d). The presence of St. Luke’s Hospital has spawned a de facto medical district of providers in the Utica Business Park and along Burrstone and French Roads (e.g. Slocum-Dixon Medical Group, Omni Surgical Center, Mohawk Valley Endoscopy Center). Removal of the anchor institution, St. Luke’s Hospital, to Downtown Utica will result in less convenience for the medical providers and their patients, reduce opportunities for collaboration, and appears contrary to the intent of PBH 2825-b (4)(d). Since it acknowledges the feasibility of putting the Project on the St. Luke’s Campus and its plan to retain at least some services both there and at SEMC, the Applicant needs to explain why the purpose and provisions of PBH 2825-b were not seen as a “fatal flaw” to the Downtown Site (and to any site other than St. Luke’s Campus), otherwise its “fatal flaw” analysis appears to be arbitrary. After most of the sites were eliminated due to “fatal flaws” the Summary Memorandum indicates that the remaining three (St. Luke’s, Downtown, and the Psych Center) were scored based on points assigned for certain criteria. As noted under C, above, the Applicant made no effort to determine criteria to protect the Public Interest. The criteria that were chosen appear arbitrary/subjective. For example, proximity to the Thruway and Oriskany Blvd. is deemed important, but proximity to the Parkway/Pleasant/Burrstone corridor that would collect traffic from Corn Hill, South East Utica, and northeastern Town of New Hartford; and French Rd./Champlin Ave. that would collect traffic from South Utica and New Hartford Village, is not. Distance to employees (using zipcode “centroids” rather than actual distances) is deemed important, but distance to actual patients is not, and distance to medical providers is not. The scoring appears equally arbitrary/subjective. Two points are assigned to Downtown for having a “Potential microgrid opportunity,” while St. Luke’s received no points for actually having a microgrid (the Co-Gen Facility). Why were 4 points not deducted from Downtown for the 2500 foot gas line referenced on Draft EIS p. 94/3527? Why was a point not added to St. Luke’s for not encroaching on a potential federal wetland when the Draft EIS’ “Capacity Analysis” (p. 1596/3527) demonstrates project elements could be arranged on-site so as not to encroach on the wetland? As previously indicated, the criteria have not been related to the purpose, objectives and goals of PBH 2825-b . In so far as the environmental criteria are concerned, they appear selective, subjectively scored and inadequately explained and have not been related to the legal requirements of SEQRA (as detailed under Part III, infra) to avoid/minimize environmental impacts or of other provisions of the Environmental Conservation Law. Applicant’s choice of St. Luke’s rather than the 2nd-ranked Psych Center as its “second option” suggests that even Applicant believes that the scoring process was arbitrary and subjective. In light of the above, the criteria and scoring provisions of the site selection process appear to have been arbitrarily chosen and calculated to achieve a predetermined result, making them unreliable for decision-making. I. Capacity Analysis: A “conceptual capacity analysis” was performed on the top three sites to, essentially, position the elements of the Project on those sites. Interestingly, the analysts chose to distinguish an “urban site” (with a 10 acre requirement) from a “suburban site” (with a 45 acre requirement) without explaining why an urban configuration of elements could not be employed on a suburban site to conserve space, avoid environmental impacts, and allow for future growth. Although an answer to the question “What is the cost premium of the recommended site?” is promised, it appears no where. (Draft EIS p. 39/3527, and Appendix D). Again, the selection of data and conclusions presented appear to be arbitrary and unreliable for decision-making. J. The Site Selection Process’ failure to incorporate 6 NYCRR 617.7(c)(1) criteria makes the Draft EIS incomplete and insufficient to support SEQR findings. All levels of government that will fund and/or approve aspects of the Project are obliged to make a SEQR finding that the project will avoid or minimize adverse environmental impacts to the maximum extent practicable (etc.). All draft environmental impact statements must contain “a description and evaluation of the range of reasonable alternatives to the action that are feasible, considering the objectives and capabilities of the project sponsor. . . The range of alternatives may also include, as appropriate, alternative: (a) sites . . .” (6 NYCRR 617.9(b)(5)(v)(a)). While an applicant cannot be made to consider sites it does not own or have under option as an alternative (see 6 NYCRR 617.9(b)(5)(v) (‘g’)) (i.e., the Applicant here could not have been made to consider Downtown as an alternative), where an applicant, as the Applicant here, admits that it owns a site that meets all its objectives and capabilities, a government agency could not honestly make its SEQR finding if it appeared that the owned-site might better avoid/mitigate adverse environmental impacts. Failure to include this analysis is fatal to going forward on the Downtown choice because at this point the record is incomplete for the purposes of supporting a SEQR finding. The EIS needs to supply this information and be able to support a conclusion that the Downtown Site better minimizes/avoids environmental impacts. Various e-mails (see e-mail ‘dump’ or images) exchanged in January and February 2015 (about the time that the PBH 2825-b funding was announced) among County Executive Anthony Picente; former State Senator, County Executive and current counsel to MVHS Raymond Meier; Lawrence Gilroy, Co-chairman of the Mohawk Valley Regional Economic Development Council (MVREDC); Mohawk Valley EDGE (MVEDGE) President Steven DiMeo and Assemblyman Anthony Brindisi; reveal that this group of individuals, who are effectively the local “gate-keepers” controlling Applicant’s access to the State’s Grant apparatus, wanted the Project to be located Downtown for urban renewal purposes and that they would try to steer the process to that end.
" … My whole thought process in bringing Elan on board is to make sure that we guide siting decision in favor of downtown..." [emphasis supplied]. MVEDGE hired Elan to do the site selection study, and the Summary Memorandum was provided by MVEDGE, Elan, and O’Brien & Gere (OBG, also author of the Draft EIS). Against the backdrop of a Summary Memorandum that shows an inconsistent and somewhat arbitrary process, the still-secret status of the siting study, and Applicant’s voluntary designation of St. Luke’s Campus as its ‘second option,’ the e-mails suggest that the site selection process may have been tainted by undue influence and that the conclusions and recommendations of the site selection process, to the extent reported in the Draft EIS, reflect this influence and must be discounted accordingly. 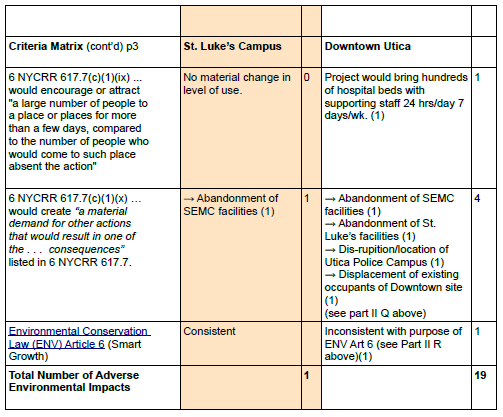 The Applicant is unable to proceed on the Downtown Site in light of its ownership of a satisfactory site at St. Luke’s Campus, and the lack of data in the EIS to support a conclusion that the Downtown Site better avoids/minimizes adverse impacts than the St. Luke’s Campus – which is unlikely given the analysis in Part III below. Applicant’s choice of its St. Luke’s Campus as a “second option” is supportable on the existing record because it already owns the site and cannot be made to consider sites it neither owns nor has options upon. If the Applicant wants to proceed with the Project on the St. Luke’s Campus, it would accordingly have to revise its designs and the EIS. Our Abominable Environmental Record . . .